There are so many varieties of tacos in Mexico cuisine – they can be soft, fried, or even crispy. In Mexico you can find every type and you can find them anywhere. My favorite, of course, are still barbacoa tacos, tacos al pastor (recipe coming shortly), and these chorizo and potato tacos. 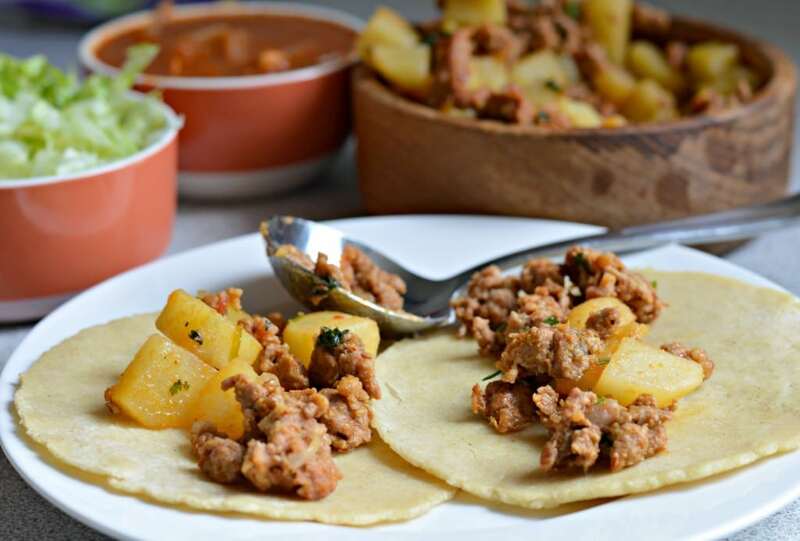 Made with homemade corn tortillas, these chorizo and potato tacos are delicious! I remember making these with my grandma when my grandpa and my uncles were out harvesting corn and beans. Whenever they got home from a hard day of work, they were very hungry and we were happy to have these delicious tacos waiting for them. They aren’t only great because they are inexpensive to make, but they are actually really good too! To start, you should go ahead and make your own tortillas. Although if you don’t have a lot of time, you can always buy them pre-made at the store. I saw some raw tortillas the other day in the frozen section and they looked pretty good! That said, it really isn’t very hard to make your own tortillas, so if you have a little extra time go ahead and give it a shot! 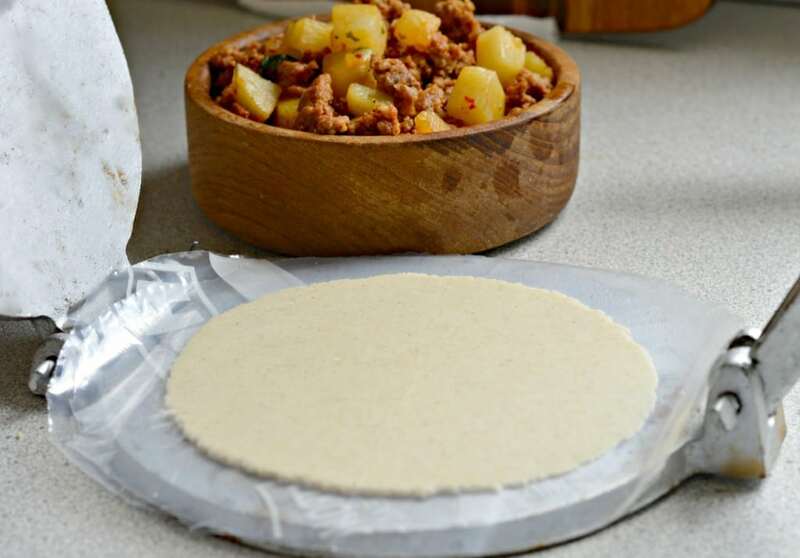 For the homemade tortillas, you will need corn flour (maseca). Form the dough by following the instructions on the package (basically just water and salt). 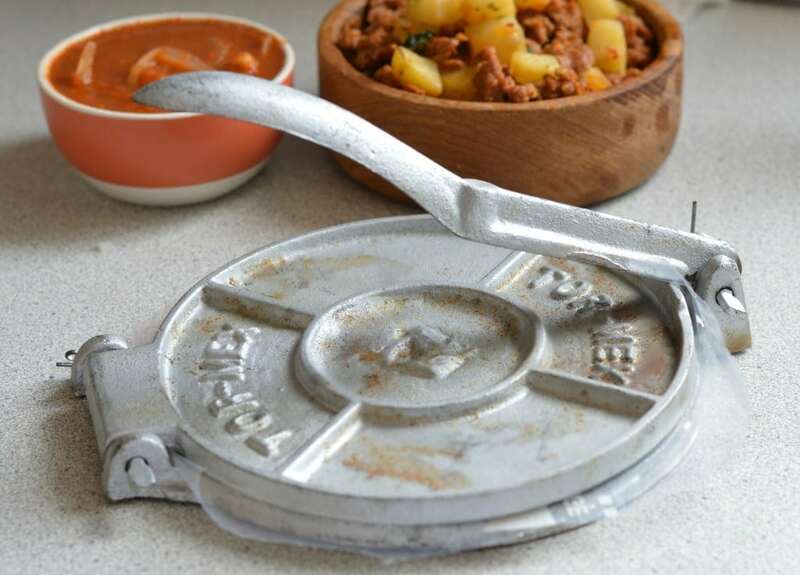 Once ready, you can make them pretty easily using a tortilla press. When the tortillas are flat they are ready to cook on a skillet or other non-stick pan. After they are cooked though, set them aside and they are ready to add the chorizo and potato filling. Like I said above, these tacos are the best when you make them with homemade tortillas, but they wouldn’t be the same without a fresh and delicious homemade salsa, and what salsa is better to give food that nice spicy kick than a fresh Mexican salsa? In the house where I grew up, my abuela always had fresh chorizo that she made herself to use and to sell. 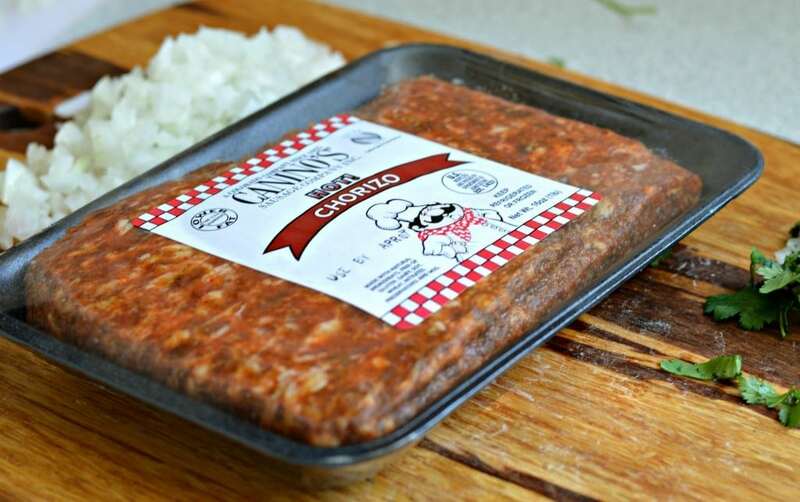 Unfortunately I don’t have access to that fresh of chorizo now, but for this recipe I used the pre-packaged chorizo that looks kind of like ground beef – not the kind that comes in the form of a sausage. You can find differing levels of spiciness – being Mexican, I of course chose the spiciest! You should cook the chorizo while the potatoes are boiling in a pot of water for about 15 minutes. This is important so that the potatoes are soft and tender. 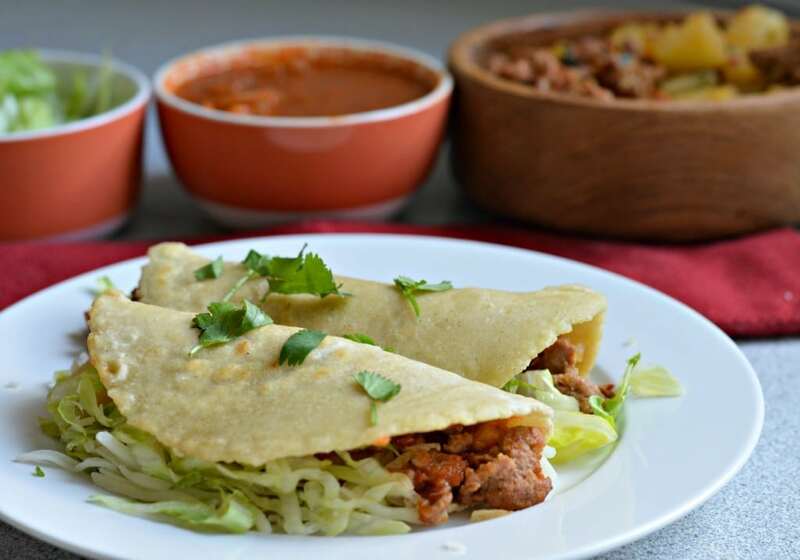 After combining the chorizo, potatoes, seasonings and cilantro in a skillet and cooking through, the last step is to add the mix to your homemade tortillas, and finally to add the salsa, lettuce, and cheese! This mix is great to use on burritos, quesadillas, and more too! If you try these, let me know how they turned out in the comments below! 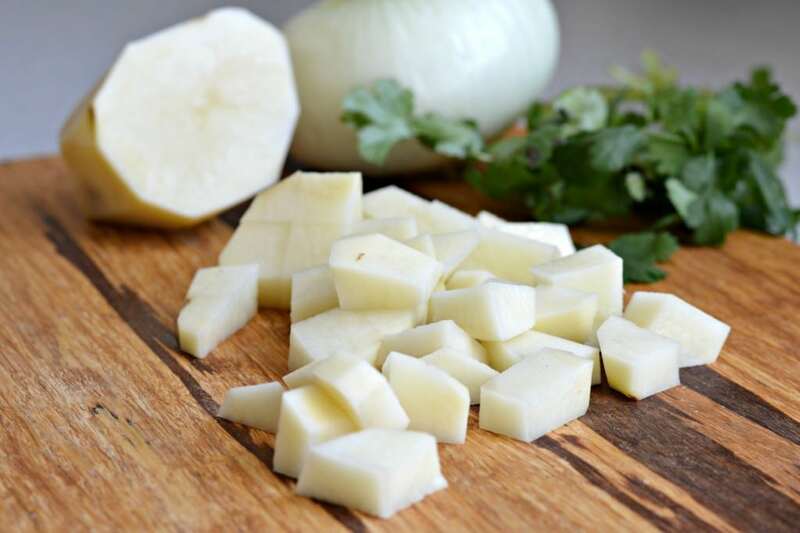 Cook the potatoes in a boiling pot of water for 15 minutes. 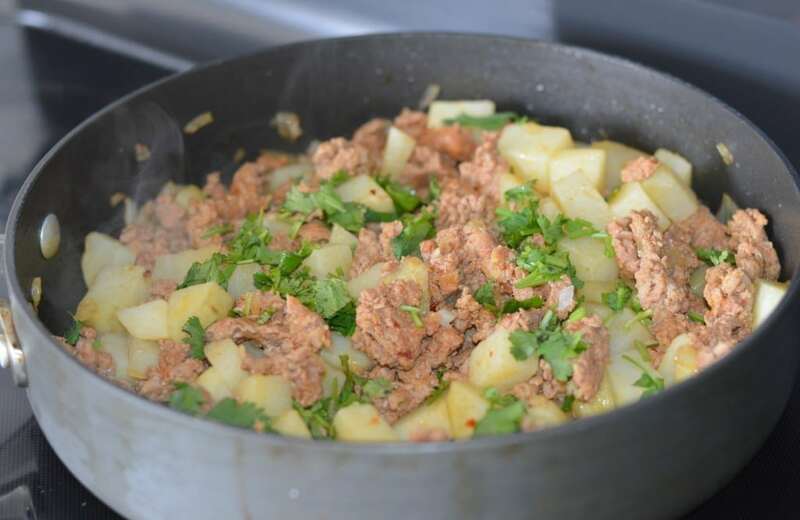 Cook the chorizo in a skillet until browned, and add the softened potatoes, the onion, the cilantro and the seasonings. 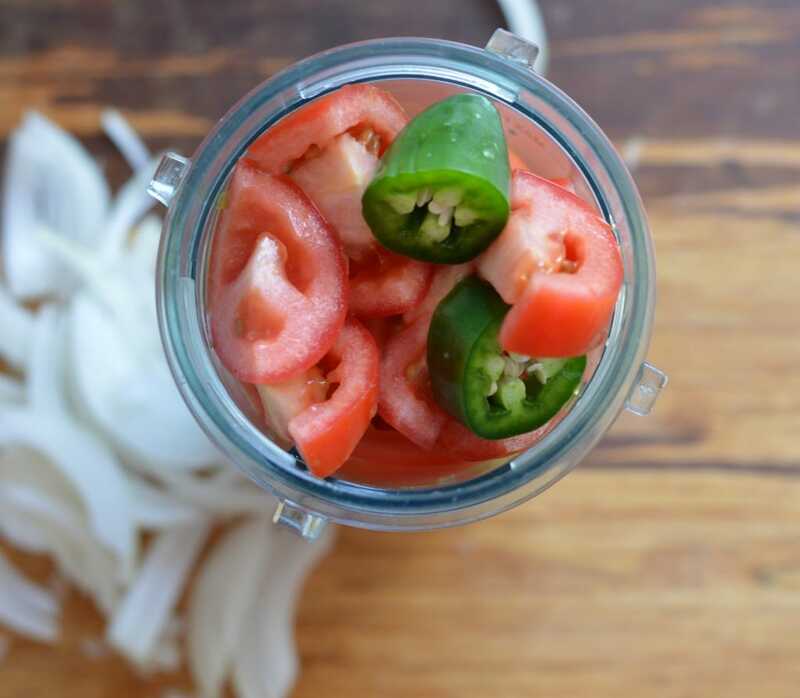 Blend all of the Salsa Roja ingredients in a blender except for the onion. Transfer to a frying pan and cook the salsa with a small amount of olive oil. Add the onions and let cook for a few minutes. Cook on a frying pan and add the chorizo and potatoes filling. I hope you have a wonderful Valentines Day tomorrow. Thank you i hope you have a great day too! Ooh, these look absolutely delicious! Even though I just ate lunch, they are making me super hungry. These look AMAZING!!!! Sounds so good!!! I am going to bookmark and try to make these. I usually make chorizo con huevo and papas con huevo tacos but I guess this is a combination of the best of both! I hope you will stop by and share some delicious recipes on my Small Victories Sunday linky that is open a little early for this week! I love that tacos are so versatile! 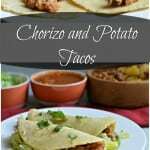 These potato and chorizo tacos sound fantastic. Tortillas are a staple at our house because you can do so many things with them!! Thanks for sharing!! Holy Cow, I’m in heaven! Growing up in San diego, tacos with potatoes were one of my favorite foods. I always treat myself to one (or two) when I visit home.. I’ve always had them made with hamburger, chorizo sounds yummy. I don’t find them often here in Colorado. can’t wait to try this tomorrow. Thanks so much.